Written by: Jiří VašekSkiing the Savoy Alps is an unforgettable experience, but France is pretty far away, and travel agencies don’t usually have the latest information on snow conditions, open pistes, or lift operations. Visit the web sites of individual resorts to get the info you need to plan a trip. 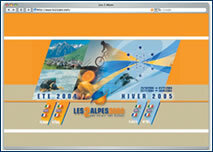 This single site represents “Three Valleys”, associating the highest, Val Thorens, popular Méribel and Les Menuires, Courchevel, and the small villages of La Tania and Brides-Les-Bains and Orelle. You can go to the resort where you want to stay, or you can watch web camera broadcasts. Unfortunately the more precise “route planner” on the orientation map refuses to communicate, as do the windows for on-line reservations and paying for lift passes. All the centers have interlinked trails totalling 600 km, so a map would be a good idea. 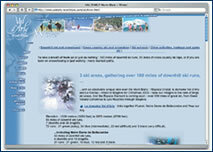 Instead, the site offers the creation of a day-long program depending on the weather and your skiing skills. A nice web presentation of this peaceful center, ideal for families with children, which people here call simply “Plán_” (Planes). Its French and English versions offer both a well laid-out map of the entire area and a panoramic aerial view. Also useful is the link to “practicalities”, under which there are descriptions of arrival routes to a total of ten villages that constitute the “planes”, including bus and train links. It also has detailed maps of individual parts of the resort, with numbers marking hotels, swimming pools, lift and cable-car boarding stations, bus stops, ski schools, etc. Informative documents in PDF format are also available. The “Two Alps” site is targeted mainly on combining fun on the slopes with night life, or “aprŹs ski”, in a well arranged presentation. Lodging and services – pubs, shops, banks, healthcare facilities, etc – are all listed. Clicking a sun symbol reveals all weather conditions, while a rosette links to information for getting to the resort. 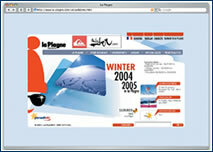 You can also buy lift passes on-line and find out if the all-terrain trail to the village of La Grave is open. This nearly unknown winter center near Europe’s tallest mountain, Mont Blanc, is about 20 minutes from the renowned Albertville. The resort’s web site, covering four villages, provides information on slopes for night-skiing with torches, sleigh rides, visits to a breeding station for draught dogs, opening hours of small churches, and more. There’s a precise map of trails and their elevation drops, info about trips on snowshoes and to local cheese makers, as well as connections to the neighboring centers of Flumet, Notre Dame de Bellecombe, and Praz sur Arly. Each of these has information on snow cover, on access roads as well as slopes! 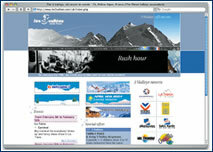 Operated by the international information center Ski in France in cooperation with CK Skol, this site has information arranged for Czech travelers to France. Important telephone numbers, connections from Savoy Alps to the airports in Geneva or Lyons, open hours of resort offices, French holidays, etc. The site also offers a list of tour operators focusing on ski outings, including contacts, and a pictogram guide to about 30 of the best-known centers, with updated daily snow conditions. The detailed interactive map of the Alps shows individual sites – just a click of the mouse reveals all you need to know prior to departing. A modernized site operated by the Road and Highway Directorate, intended to inform drivers about current road conditions. Info ranges from roads under construction to winter reports on roadway temperatures. A new web site that should facilitate contacts between citizens and landmark department officials. It contains news concerning landmark care in Prague, including information on grants and other related legislation. Check the operating system in the relevant window, and a special program checks your PC for viruses. In the event that the system finds dangerous code it neutralizes it, but it doesn’t provide permanent protection. This site provides basic information on buying or renting one of the 4.2 million apartments in the Czech Republic. You’ll find out how to lower the purchase price or, conversely, how to raise the price when renting out an apartment. This is a function used with the latest digital camera models and graphics software. It makes it easy to find out if your picture was correctly exposed and stored, because its display on a camera or computer screen can be completely distorted. So the picture is transformed into a simple graph whose curves show the arrangement of shadows and bright spots. For example, if there are no pixels in the bright spots (such a spot is called “overburned”), no other information can be imported into them and they stay pure white without any markings. It’s generally true that the shape isn’t important for a histogram, but the distance from the graph’s margins should be as small as possible.